Assessment of opportunities in -three- sub-sectors for potential trade between SMEs in the EU counterpart countries and Nepal. 4 marketing / international business courses for Nepalese business IBOs. 2.2.1) Determination of the system to exchange business information between Nepali IBOs and European partners. "Enhancing the Capacity of Intermediary Business Organizations in Nepal" (ECIBON) Project funded by the European Union and Implemented by European Economic Chamber (EEC) - Nepal under Asia-Invest Program. a) Aim: to make Nepalese IBOs better equipped to service local SMEs and European intermediary counterparts to facilitate trade between Europe and Asia (Nepal). b) Target group: at least 15 Nepalese business IBOs whose capacity can be strengthened through training, information provision and a strengthened and broadened network. 80 indirect beneficiaries whose capacity will be developed in mainly two areas through regional seminars. EEC-Nepal is implementing European Union project entitled "European-Asian Integration in Sustainable Tourism Management (Asian-Tour)" under Asia Invest program of the European Commission. 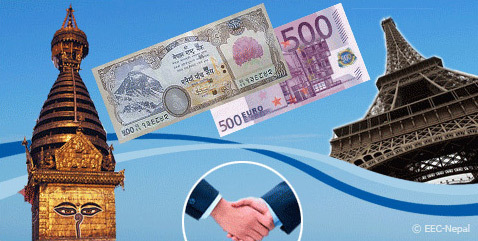 EEC-Nepal is implementing European Union project entitled "European-Asian Integration in Sustainable Tourism Management (Asian-Tour)" under Asia Invest program of the European Commission.